The Folklore Museum of Chora town in Kythnos was founded in 2014, at the initiative of the youth of Chora (Cultural Association of Chora Kythnos) and the valuable contribution of the inhabitants. It is a folklore collection of objects that are displayed in a traditional house in the “Piazza” of Chora, in which you will discover the spiritual treasures of Kythnos and you will experience its lively tradition. It was founded by the active Association of Dryopidians (people originating from Dryopida Kythnos) in an old preserved house behind the church of the Holy Apostles. 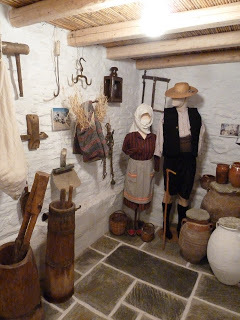 Agricultural tools are on display in the ground floor while the traditional uniforms of the male and female farmers, the equipment of the cell, the “bed” and the textile artifacts. The first floor illustrates with authenticity a traditional house of Thermia (kitchen, hall, bedroom), while on its walls are decorated with the engravings of Kythnos. The Ecclesiastical & Byzantine Museum of the island is hosted in a specially designed area at the church of Saint Georgios in Dryopida and was founded on the initiative of Father Constantine Gonidis. There are several ecclesiastical exhibits of the Byzantine era in the museum and several icons that have survived over time.